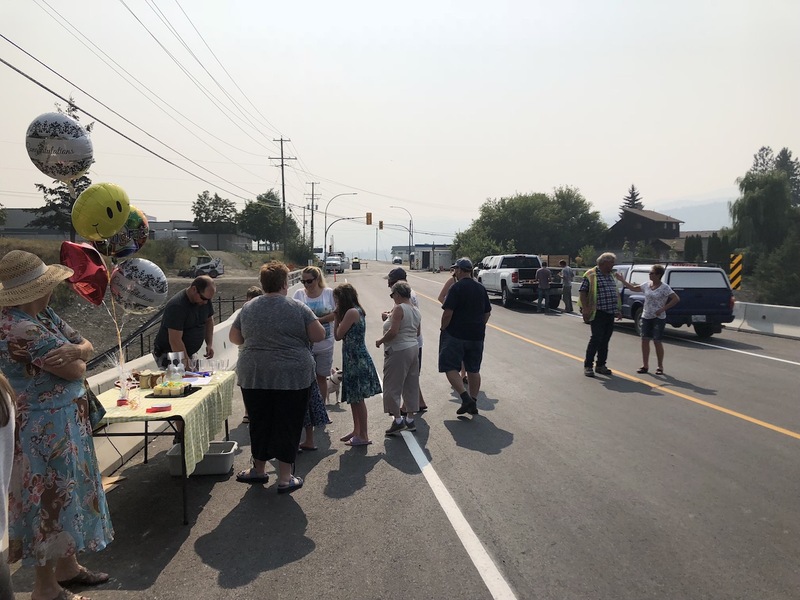 HEFFLEY CREEK – The new Heffley Creek bridge wasn’t quite ready for general traffic but it received a champagne opening on Thursday (Aug. 16, 2018). Crews from Acres Enterprises were still putting the finishing touches on the bridge as a ribbon was cut in a resident-organized ceremony, followed by cupcakes and champagne. Deb McDougall, secretary-treasurer of the Heffley Creek Hall and publisher and editor of the Heffley Creek Holler, did the ribbon-cutting honours along with Laurie Sallows of the Heffley Creek Store. The bridge is a replacement for the culvert washed out by the flooding of Heffley Creek in May of 2017. It cost the City of Kamloops close to $2.5 million. “it’s been a long time coming, as only Heffletarians could know,” said McDougall as she prepared to cut the ribbon. She said the washout also wiped out the water line and the community has been on a boil water advisory ever since. And what had been a short trip of a few blocks from one side of the creek to the other became an eight-km. detour on the Yellowhead Highway. New school bus and City transit routes had to be established. “We’ve been delayed again and again so many times we wondered if the thing would ever get build,” McDougall said of the bridge. However, she praised the construction crew for its hard work and determination in getting the job done. Coun. Ray Dhaliwal attended representing the City, and I attended on behalf of the TNRD. As the ceremony was being held, the bridge was temporarily open to local traffic only, but McDougall said Heffley Creek has been unified with its completion. — Mel Rothenburger, Director, Electoral Area P, TNRD.